I read in the New York Times this week of the death at 96 of the great American poet, Richard Wilbur. Wilbur was a former poet laureate of the United States, a two time Pulitzer Prize winner and a National Book Award winner, who published numerous volumes of poetry, as well as children's books, translations of Moliere plays, and song lyrics. He teamed with Leonard Bernstein as the lyricist for the Broadway musical, Candide. Wilbur held a special place in my heart, not only because of his great poetry, but also because he was one of the very few great American poets that I actually got to meet and talk to. In 1967, Wilbur was a visiting artist at the Spring Arts Festival at Bloomsburg State College (now University), where I was a sophomore history major and aspiring actor. As part of the Festival, and as a way to honor Wilbur, the Bloomsburg Players were putting on Wilbur's translation of Tartuffe, by Moliere. As a member of the cast, I was invited to a seminar that Wilbur gave on campus, just a dozen students sitting around a table and chatting about poetry and plays. Wilbur was central casting for my youthful idea of "poet." He was in his forties then, quite handsome and urbane, wearing a turtle neck and patch sleeved sport coat, and smoking a pipe. His voice was deep, resonant, friendly and authoritative. I clearly remember that day that Wilbur discussed one of his poems, The Juggler. Swinging a small heaven about his ears. And trades it all for a broom, a plate, a table. And all come down, and he bows and says good-bye. Who has won for once over the world's weight. I remember, in particular, Wilbur telling us that he tried to get that last line "Who has won for once over the world's weight" to sound like a ball bouncing on a floor, less and less, until it finally stops still. The poem is typical of Wilbur's poetry: formal. witty, spiritual, but not preachy, and absolutely virtuosic in its command of form. When I became a teacher, I discovered that Wilbur also wrote (and illustrated) books for children, including his series called, Opposites, which I would often use in class. That’s much too difficult. I quit. In Wilbur's translation of Moliere's Tartuffe, I got to speak these lines. Enough, by God! I am through with pious men! Because that bigot censures all our actions? Great fun and simply a joy to perform. 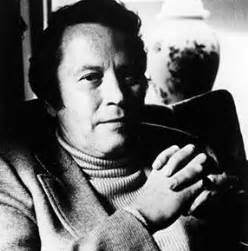 Richard Wilbur was a great poet who deserves to be celebrated, but most importantly read. If you were looking to buy just one volume of his work, I would recommend New and Collected Poems, one of his two Pulitzer Prize winning volumes. I'll finish this piece with one more of my favorites.